This auditioned, male and female mixed choir exposes students to an increasingly advanced choral repertoire. Students sing in many languages, both accompanied and a cappella. Additionally, the Concert Choir becomes the cast of our musical, which is produced every other year. 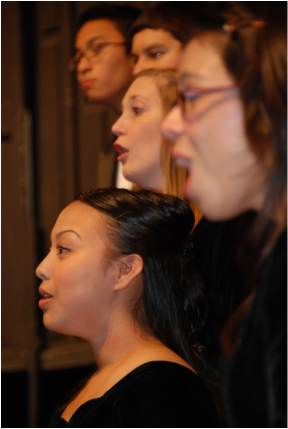 Concert Choir students also have the opportunity to participate in tours and competitions. Please read the documents attached below carefully. Third period Concert Choir has begun after school and evening Annie rehearsals in the District Auditorium and it is important that each student be present when they are called to be there. The French Breakdown lists which students are in each part of the show. Most students appear as multiple characters, so please read it carefully. Once this is clear, the students can look at the schedule or rehearsals and performances to determine when they need to be at rehearsal. They will also need to reference the page numbers in their librettos (scripts) to see if they need to be at a particular rehearsal. A modified schedule may be posted at the beginning of each week as we discover which areas of the show need more time. The posted roles document states what spoken or sung roles are played by which students. This can also be used to help you figure out which rehearsals students need to attend. The contract needs to be signed by the students and parent/guardian stating the role(s) that the student has earned and that they have committed to fulfill them. Please read that contract carefully and return it signed by this Friday in class. Hard copies of the schedule and contract were passed out in class on 1/11/16 and additional copies are available if you need more.